Nanjing Dashengguan Yangtze is the longest bridge in the world with a continuous arch. Image courtesy of Thyristorchopper. The bridge has used around 80,000t of steel in total. Image courtesy of J. Ye. Nanjing Metro serves a population of around 5.2 million in Nanjing. Image courtesy of Kenneth Lu. A CRH380 high-speed train runs on the Beijing-Shanghai High-Speed Railway line. The Nanjing Dashengguan Yangtze River Bridge was constructed to complement the Beijing-Shanghai High-Speed Line. 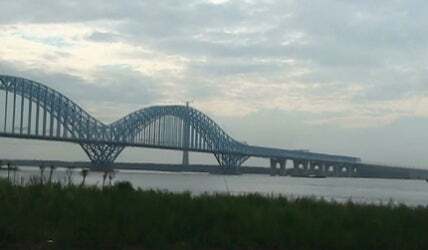 The bridge is located within the Jiangsu Province, in the upper reach of the Yangtze River, about 20km from the Third Nanjing Yangtze River Bridge. Construction began in 2006 and was finished in 2010, with the bridge becoming operational in January 2011. Owned by the Ministry of Railways of the People’s Republic of China, the Nanjing Dashengguan Yangtze River Bridge is recognised for being the longest in the world with a continuous arch, the first Chinese bridge with six tracks and the bridge with the highest loading capacity in China. The bridge, which cost $537m to construct, won the George S. Richardson Medal for a single, recent outstanding achievement in bridge engineering in 2012. "The bridge, which cost $537m to construct, won the George S. Richardson Medal for a single, recent outstanding achievement in bridge engineering in 2012." The Nanjing Dashengguan Yangtze River Bridge bears the weight of six track live-load and 920kN/m of dead load, which is the largest railway loading in the world. The bridge has an overall length of 9,273m, with a main bridge length of 1,615m, and it is designed for speeds of up to 350km/h. It consists of six tracks that include two lines for the Beijing Shanghai High Speed Railway, two lines for the Shanghai-Wuhan-Chengdu Railway and two lines for the Nanjing Metro. The main bridge is a double continuous steel truss girder and a continuous steel truss arch bridge with a main span arrangement of 109m+192m+336m+336m+192m+109m. The southern approach, which also forms part of the main bridge, has two spans of 84m each. The bridge has a navigational clearance capacity of 32m. The steel arch trusses were installed with the double cantilever construction method, using crawl cranes, while the brackets are supported by piers with the towers placed on top. The parallel chord trusses, in contrast, were installed using a full cantilever construction method, supported by temporary piers. The 1,318km Beijing-Shanghai high-speed line connects the cities of Beijing, Shanghai and Tianjin, travelling across the provinces of Hebei, Shandong, Anhui and Jiangsu. The bored piles, which were installed by drilling from platforms, are up to 112m in length and 2.8m in diameter. The bridge is estimated to have used 80,000t of steel in total. BHC Global (MBEC) acted as the main contractor for the construction of the bridge. The other key players involved with the project include China Major Bridge Engineering and China Railway Baoji Bridge Group (CRBBG). WNQ570, a fifth generation bridge steel variety, was used for the Nanjing Dashengguan Yangtze River Bridge. The steel was developed by Wuhan Iron and Steel (WISCO) and China Railway Major Bridge Reconnaissance & Design Institute (BRDI). Beijing-Shanghai High-Speed Railway Company, along with Wuhan Iron and Steel Group, was also responsible for developing a new steel alloy that was used for the bridge. CRTB was in charge of constructing a section of the bridge, Luoyang Xingrong Industrial (LYXR) provided the bridge support infrastructure, while vibratory hammers used for the construction were provided by Yongan Machinery. "The Nanjing Dashengguan Yangtze River Bridge bears the weight of six track live-load and 920kN/m of dead load, which is the largest railway loading in the world." Minmetals Steel supplied about 45,000t of steel for the bridge and Sobute New Materials provided the polycarboxylic concrete admixture (PCA). The Beijing -Shanghai High-Speed Railway line is 1,318km long, cutting down the journey time between the two cities from 14 hours to five. Two thirds of the line is constructed on embankments, with majority of it laid on bridges. As of 2011, the line has 92 pairs of CRH 380BL trains, which run at speeds ranging from 250km/h to 300 km/h, including some other high-speed trains, such as CRH380A. The line became operational in 2011. Shanghai-Wuhan-Chengdu Railway with a designed speed of 200km/h and runs from Shanghai to Chengdu via Wuhan. The new line, which became operational in 2010, cuts journey time, which would otherwise take 20 hours, by nine hours. Nanjing Metro has around 65 six-car train sets running on two lines, which serves around 5.2 million people in Nanjing. Line 1 of the metro became operational in 2005, with Line 2 following in 2010. Line 3 is currently under construction.